On my last day in Holland, I played with some of my new buddies that I met at school. This is Joshe, Adam and Julius. They were sad to hear it was my last day. Will Stanley ride in the airplane tonight? How long will it take for him to get to Texas? Such curious boys. 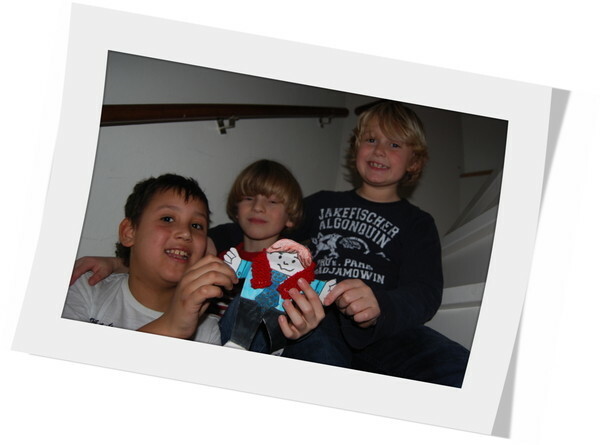 Maybe my new school friends from Holland can send a Flat Stanley like me to Sour Lake Elementary. I will miss these guys. Today is Thursday, January 26, 2012. I should be picked up at 5:00pm by the Dutch mail person. How long will it take for me to get from Vleuten, the Netherlands to Sour Lake, Texas? Mrs. Long's 3rd grade class can give the answer in the comment box below when I arrive.